This week’s LOOK BACK is from June 15, 2006. After a club meeting, I was inspired by two of the presentations. Local coin clubs are a place you can regularly go to talk about coins and numismatics with like-minded collectors. If you have not attended a meeting you should find time to go. You might find that there is a learning experience that can inspire you in your collecting endeavors. One of the reasons I try to ensure I make it to the monthly meeting of my local coin club is because I seem to leave every meeting with an appreciation for something different about the hobby. Our club encourages members to bring in their monthly finds. A numismatic show-and-tell. This week, Jerry Grzenda, a collector of many different types of coins and a serial exhibitor, showed his collection representing the last century of Iran. 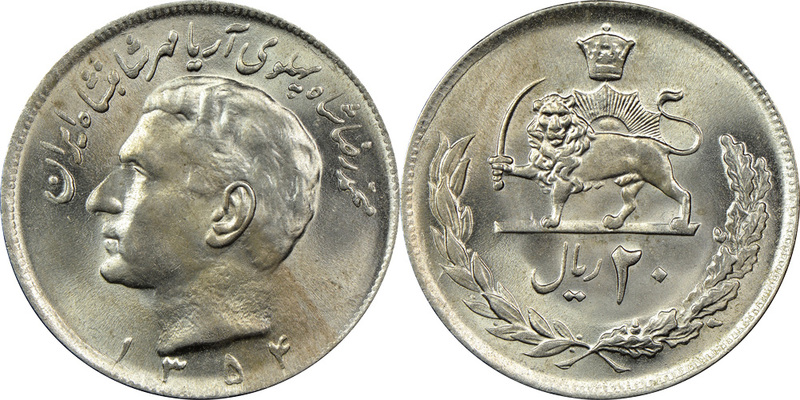 Jerry’s presentation included a history of Iran as seen through its coinage. It was a great learning experience and the coins were beautiful. There is something about the style of the Persian language that is intriguing and adds to the aesthetic of the coins. Another highlight of the meeting was the presentation by Ron Brais about Hobo Nickels. While I have heard about Hobo Nickels, all I knew about them was what I learned in passing. In listening to Ron talk, I learned that the original Hobo Nickels were created between 1913 and 1935 using only Buffalo Nickels because the design had large figures on both sides that could be used as the basis of the design. The copper-nickel coins are also softer than others allowing them to be more easily carved. These elements allowed the carver to make just about any design and usually did. Designs were as varied as the artists who carved them. Hoboes would use the carved nickels to trade for food, shelter, or other favors during their travels. The most famous Hobo Nickel artist was George Washington “Bo” Hughes. Bo ran away from home at a young age and was befriended by a hobo identified as Bert. After a train yard scuffle, Bert took Bo under his wings, protected him from the tramps and bums and taught Bo how to carve realistic images into the Buffalo nickel. For many years, Bo would ride the rails and carve nickels living the life of the hobo as he looked for work to survive. Bo’s work on Hobo Nickels allowed him to eventually get a job as a craftsman. It lasted until 1957 when he cut his left hand while carving a nickel. At that time Hobo Nickels were no longer popular and Bo just faded away. He died in 1982. The life and history of George Washington “Bo” Hughes has been immortalized in the book Hobo Nickels by Delma K. Romines (out of print). Today, the Original Hobo Nickel Society has a number of artist members that are carving images into Buffalo and Jefferson nickels to keep the art alive. Some of the designs are ingenious and beautiful while others are copies of carving on older coins. Modern nickels are made using modern tools that allow the carving to look much cleaner than their older examples. The old methods and tools were not able to make clean lines but it gave them a character that cannot be matched. To see the work of modern Hobo Nickel artists, follow @Hobo_Nickel_Soc on Twitter and try to resist not buying them! The example of a Bo Hughes carved nickel displayed as part of the presentation beautiful in its design and execution. The care and craftsmanship that went into carving that coin was evident. Hobo Nickels can sell from $200-$1500 depending on condition and the artist. Coins by Bo Hughes are worth more than others.